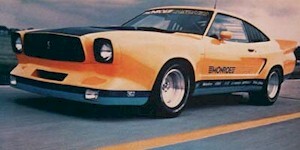 The 1978 Monroe Handler Mustang was a body kit created to promote the Monroe Handler series street performance shock absorbers. Creative Car Products sold the 8-piece fiberglass body kit. Pieces included the front air dam, rear spoiler, rear body panel, all 4 fenders. The kit was called the "Handler II". It was designed by Dave Kent. One (original) car was built with a metal body kit. Six more were built using fiberglass components to be given away as contest prizes. Check this one out. It's a 1978 Monroe Handler Mustang. It's owned by Stephan Gable. This is our featured Attitude Of The Week for the week starting August 20, 2018. The Monroe Handler was a body kit by Creative Car Products to promote Monroe Handler series street performance shock absorbers. Steve tells us about the specs, "Steel custom hood, fastback not hatchback, modified grill, front cowl, lighting circuit, roof, front suspension, 8.8 posi rear..."
Is this a Mad Max Interceptor Mustang? No, It's a 1978 Monroe Handler Mustang. It was a body kit featured in a June 1977 Hot Rod Magazine custom build to promote Monroe's Handler line of shock absorbers. For a mere $1250 you could get your own fiberglass body kit. This version wears a set of custom 18-inch KMC dime wheels with Nitti 555 R 275-40/18 tires. This is a magazine ad promoting Monroe's Handler series street performance shock. It was displayed on a custom bodied 1978 Mustang II. The ad talks about the 1/24th scale Monroe Handler Mustang Revell plastic model you could purchase. Check out this yellow 1978 Monroe Handler Mustang II hatchback. It has a custom hood, interior, and Lambo doors! This car has since been restored back to looking more like the original Monroe Handler.